Weekends and snow-days call for a leisurely pace, complete with slow-food, togetherness, yummy smells and delicious tastes. The kids find great excitement in whipping out the waffle iron, mixing bowl, and maple syrup to cook up a scrumptious breakfast. 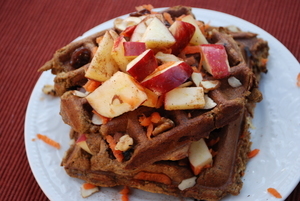 I love finding nutrient dense ingredients to pack into those lip-smacking waffles. Give these a try on your next lazy day! Mix wet ingredients together (I used a Vitamix blender). Spoon mix into waffle iron and cook per manufacturer’s instructions. We topped ours with diced apples, graded carrots, raisins, slivered almonds, pomegranate nibs, 100% pure maple syrup and paired it with some tofu scramble. Also makes a tasty lunch with peanut butter, bananas, and/or jelly. These sound delicious! Might be daunting for people used to mixes because they sound more labor intensive, but most of the ingredients are pantry staples anyway — especially for vegan households. Can’t wait to make these! Yum!